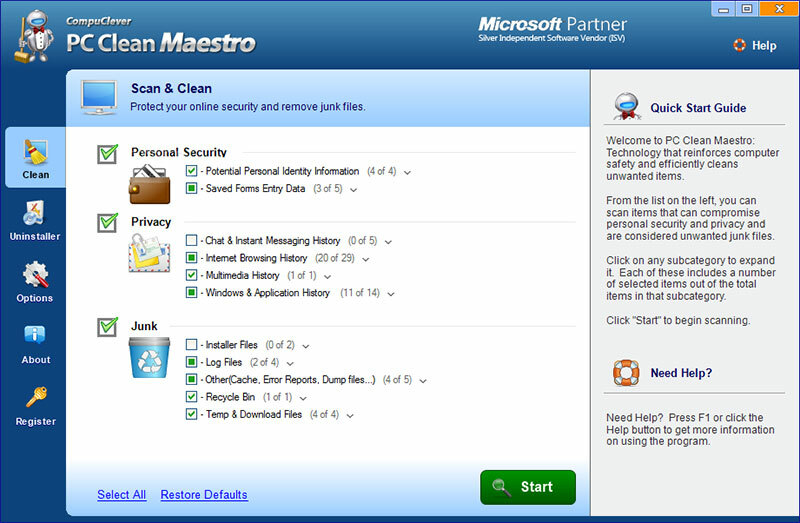 PC Clean Maestro is promoted as an optimization utility that can better the functioning of your computer. It was developed by CompuClever Systems Inc. and is supposed to remove junk files, registry entries, and traces of personal information. Unfortunately, the program is not quite as trustworthy as it may seem at first. After it gets installed, it performs a system scan, however, if you want to eliminate the detected components, you will have to purchase the full version of the application. You cannot blindly trust the scan results that are shown to you, because they are used to convince you to upgrade the software. Instead, we advise that you delete PC Clean Maestro from your computer. How does PC Clean Maestro work? The developers of PC Clean Maestro use deceiving marketing tactics in order to distribute the application. They claim to be Microsoft partners, however, that is not the case. They also use the bundling method to trick computer users into installing the program without even noticing it. Freeware and shareware that you download from sites like soft32.com, filewin.com, softonic.com, and others often presents you with additional offers. If you do not pay attention to its installation wizard, you agree to these offers automatically. That is not something we would advise. You should always choose the Advanced or Custom mode and deselect all unfamiliar apps. Once PC Clean Maestro gets installed, it performs a system scan and detects your browsing history, cookies, security log files, temporary files, thumbnail cache, and so on. You should know that these files do not actually affect the speed of your computer or expose it to any security threats. Moreover, the scan results may be exaggerated in order to convince you that you need to clean your system with the full version of the software, which costs $35.95. We do not recommend spending your money on the utility, because it is not worth it. You should terminate PC Clean Maestro without further delay. How to remove PC Clean Maestro? If you want to get rid of PC Clean Maestro, you can uninstall it manually via Control Panel or use a malware prevention and removal tool to clean your system automatically. We suggest that you go with the second option, because it is more advantageous. If you implement a reliable anti-malware application, it will not only eliminate PC Clean Maestro, but also erase other potential threats from your computer. In addition to PC Clean Maestro removal, the security software will also help you make sure that you do not have to deal with similar and more dangerous infections in the future. If, however, you prefer to delete PC Clean Maestro manually, you are welcome to use the instructions presented below this article. Please note that after the removal you will also need to erase leftover files. You can do that by deleting the CompuClever folder from your computer.